The endomembrane system include endoplasmic reticulum (ER), golgi complex, lysosomes and vacuoles because their functions are coordinated. Since the functions of the mitochondria, chloroplast and peroxisomes are not coordinated with the above components, these are not considered as part of the endomembrane system. Present in all cells except RBC, eggs, embryonic cells & resting cells. Made up of – system of parallel flattened cavities called Cisternae, connecting them are tubules. They are about 4nm thick. 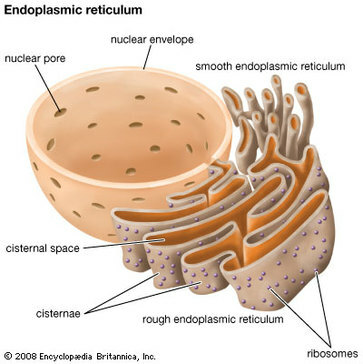 Smooth endoplasmic reticulum is without ribosomes and makes lipids modifies proteins. Mechanical support- to the colloidal matrix of cytoplasm. Intracellular transport- act as circulatory system within the cell. Synthesis of proteins and lipids. Three components- cisternae, and vesicles or vacoules. The cisternae are flattened fluid filled sacs, separated by intercisternal space. An individual sac is called dictyosome. In animal cells there are about 3-7 dictyosomes whereas plant cells have 10-20. Each cisternae is curved shallow bowl like, the convex side is called the tras face where the vesicles are formed and the concave side is called the maturing phase or the cis phase. The cis phase receives the vesicles. Transition vesicles- drop like vesicles associated with convex side of the structure that represent a zone of exclusion, a region of transition from ER to golgi. Secretory vesicles or secretory granules- These are present on the maturing phase and on the sides of the Golgi. They contain secretory products of Golgi and are finally converted to lysosomes. Secretion- associated with secretory activity. Formation of cell plate and cell wall. Rounded or spherical with single membrane containing acid hydrolases. It is present in all animal cells except RBC and few plant cells. A vacuole is a membrane-bound sac that plays roles in intracellular digestion and the release of cellular waste products. In animal cells, vacuoles are generally small. In plant cells these are large sap filled vesicles in the cytoplasm. They are bounded by a membran tonoplast. Absent in prokaryotes, lost in RBC. Normally sausage shaped but may vary in shape. They have diameter of about 1 micron and length of about 2.5 micron. A cell may have more than 1000 mitochondria. It is double layered with an outer mitochondrial membrane and inner membrane. Inner membrane has folds– cristae– studded knob-like particles called elementary particles or oxysomes. This organelle shows presence of DNA and ribosomes, which makes them capable of producing their own proteins. The mitochondrial DNA carries information for production of 30 proteins, however it still depends on the nuclear DNA and cytoplasmic enzymes for its work. Mitochondria can change their shape based on the physiological activity of the cell or depending on the activity of the organelle itself. 1. Site of cellular respiration. 4. Helps in elongation of fatty acids. Chloroplast is the most important biological plastid. It is found in the cells of green plants. They may vary in shape from biconvex to circular in higher plants, spiral in spirogyra and cup shaped in chlamydomonas. The outer membrane is smooth and permeable to small molecules. The inner membrane is semi permeable and folded greatly. These folds become free in mature chloroplasts and lie as lamellae in the matrix. The two membranes are separated by peri-plastid space- space. The stroma or matrix is the colourless proteinaceous ground substance that fills the chloroplast, contains proteins, lipids, small ribosomes, DNA molecule and RNAs. 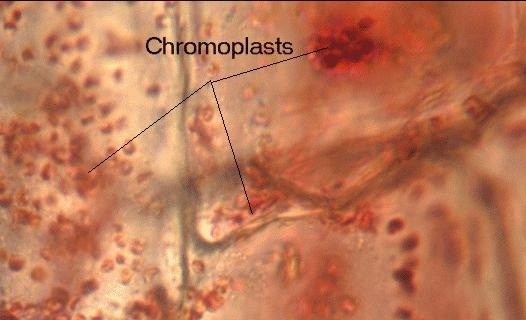 Grana –the stroma contains a system of chlorophyll bearing double membrane lamellae that form flattened sac like structures, called thyllakoids. Small thyllakoids- disc like and piled one above the other called granum. Chlorophyll is associated with this lamellae. 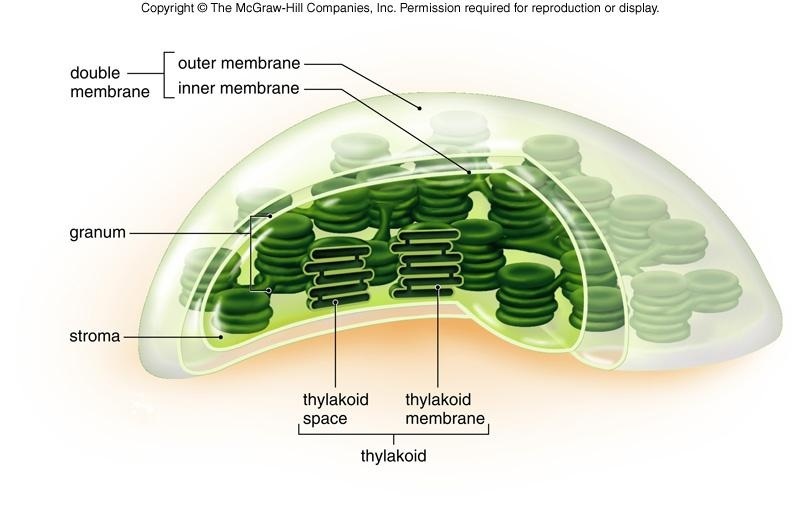 Larger thylakoids- connects the grana and are called intergranal or stromal lamellae. Like mitochondria, chloroplasts are also semi autonomous. They contain DNA and ribosomes and are capable of division. No grana and photosynthetic pigments. 1. Presence of double membrane. Ribosomes are small, dense organelles that are found in large numbers in all the cells. This was first observed by Claude. They are 20nm in diameter in eukaryotic cells and slightly smaller in prokaryotic cells. Ribosomes can occur free in the cytoplasm where enzymes used in the cytoplasm are synthesised. Ribosomes are manufactured in the nucleolus from ribosomal rna and protein. Each ribosome is made up of a small subunit and a large subunit. The cytoplasm of all eukaryotic cells contain tube like structure that form the frame work of cell. These are non membrane bound structures with minute tubules and filaments. Its maintains the cell shape and its extensions. These are microtubules, microfilaments and intermediate fibers. Microtubules were observed by Roberts and Franchi. Apart from the cell, they also occur in cilia, flagella, centrioles, basal bodies etc. These are not present in amoeba, slime moulds and prokaryotes. Each microtubule is about 25nm in diameter. The wall is formed of a series of protofilaments. These protofilaments are made up of two proteins- alpha tubulin and beta tubulin. These are arranged alternately in a helical manner. They form cytoskeleton of the cell and help in cell shape and mechanical support. Microtuibules in cilia and flagella help in locomotion and feeding. In plant cells they control the orientation of cellulose microfibrils of the cell wall. Microtubules of asters and spindle fibers of the mitotic apparatus help in chromosomal movement. Microtubules function as the microcirculatory system of the cells. Microtubules also play a vital role during cell differentiation. Microfilaments were discovered by Paleviz. These are present in microvilli, secretory cells and epithelial cells. They occur in bundles in muscle cells and are called myofilaments. Each microfilament is a long, thin cylindrical structures about 6-10nm in diameter. It is made up of globular protein called actin. Microfilament is a helical polymer of dumb-bell shaped units of actin. 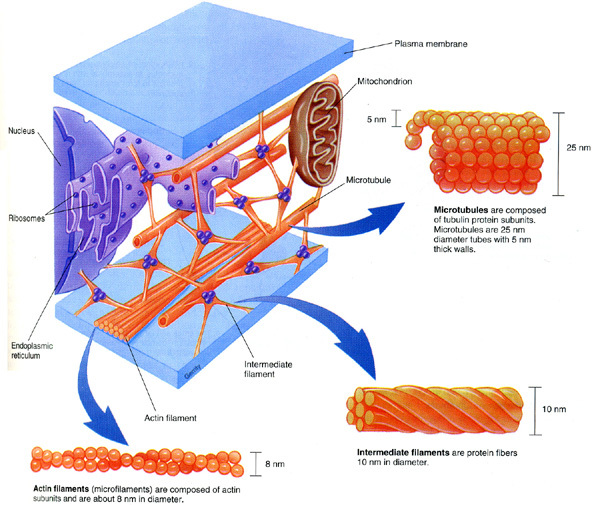 These filaments occur as myofilaments in the muscle cell with myosin and other proteins. They help in muscle contraction. These proteins also occur in other cells as a web of long fibers called as the microfilaments. These are located in the cytoplasm just below the plasma membrane. These microfilaments are referred to as cytoskeleton of the cell and help in two important functions. They help in maintaining the shape of the cell and also hepl in cell movements. Vimentin- interconnect nuclear envelope with cell membrane. These are non membranous cell organelle, mostly present in the animal cell. The centrioles occur in pairs and are called diplosome. The centrioles occur at right angles to each other. They normally occur near the one pole of the nucleus. They lie in a distinctly clear staining region in the cytoplasm called centrosphere. The Centriole and centrosphere are together referred to as centrosome. 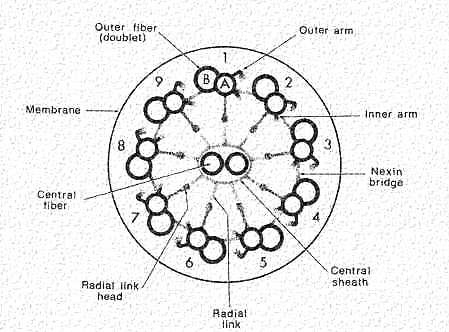 The centrioles look like rounded cylinder formed of nine groups of triplet microtubules or fibers. Each triplet has three subfibers. The inner most is A, middle B and outermost C. The sub tubule A is linked with the C subtubule of the neighbouring tubule. The linkers are responsible for the tilt of the triplets. The proximal part shows a cartwheel like structure with a central rod or hub in the center with 9 spokes radiating from it. each spoke is connected to the fibril A. The centrioles paly a major role in cell division by forming spindle fibers. Centrioles give rise to basal bodies of cilia and flagella. In sperm centrioles forms axial filament of flagellum. These are motile, hair like appendages on the free surface of cells. 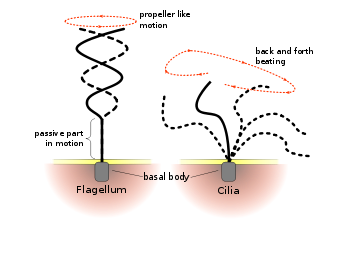 Cilia and flagella do not show any major morphologically and physiologically differences. The main difference is between the size. Cilia are small and numerous. Flagella are longer and less in number. Flagellum exhibit undulating motion and beat independently. Cilia beat perpendicularly in metachronous or in synchronous rhythmn. a partial microtubule that doesn't extend as far into the tip. cross-bridges of the motor protein dynein that extend from the complete microtubule of one filament to the partial microtubule of the adjacent filament. a pair of single microtubules running up through the center of the bundle, producing the "9+2" arrangement. The entire assembly is sheathed in a membrane that is an extension of the plasma membrane. Microbodies are small spherical bodies in the cytoplasm. They are bound by single membrane. They contain densely granular proteinaceous matrix. They have variety of enzymes that may vary according to the cell type. Play an important role in metabolism of sugars amino acids and fats. Glyoxysomes are distinct from peroxisomes because of different functions. They are found in fungi and other higher plants. Storage organs rich in oil globules contain greater number of glyoxysomes. Such membranous structures loaded with oil globules are also called spherosomes of 0.5 to 1.5 nm size and they are associated with mitochondria. When such oil laden seeds germinate, the number of glyoxysomes increases significantly and remains very active. Glyoxysomes contain a host of enzymes responsible for b-oxidation of a fatty acids, citrate synthase, isocitrate lyase, malate synthase, hydrogenase, urate oxidase, etc. Thus it has all the enzymes necessary for fatty acid oxidation as well as glyoxylate cycle and gluconeogenesis. Small bodies bounded by single membrane. It contains enzymes that synthesise oil and fat.